Adrian Alanis, 2, of Edinburg waves from the firetruck with his father Hector Alanis Thursday, May 12, 2017 at Bannworth Park in Mission. Adrian “Bubba” Alanis splashed water flowing from a tap at Bannworth Park in Mission on Thursday, soaking his clothes. Mom and dad play with him as a photographer snaps images. The 2-year-old snatches his father’s black cap, using it to hold the liquid. The family encourages Bubba to dump it on his father, and he happily obliges. Mom suggests they pour water over Bubba’s head, bald from chemotherapy. He didn’t like that idea as much. Bubba stomped in the puddle with his boots, enjoying the water on the hot Texas day. 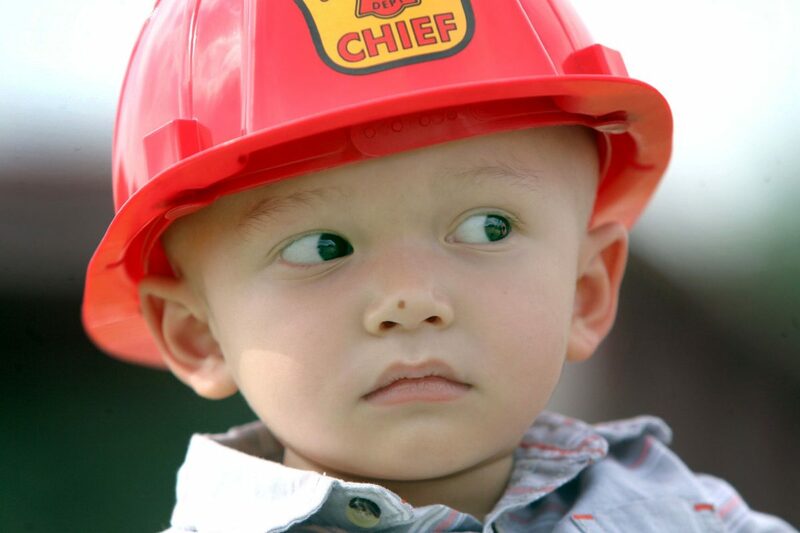 Wearing his plastic fireman's hat, 2-year-old Adrian Alanis of Edinburg smiles from ear to ear as he spots the red firetruck pulling up at Bannworth Park on Thursday in Mission. 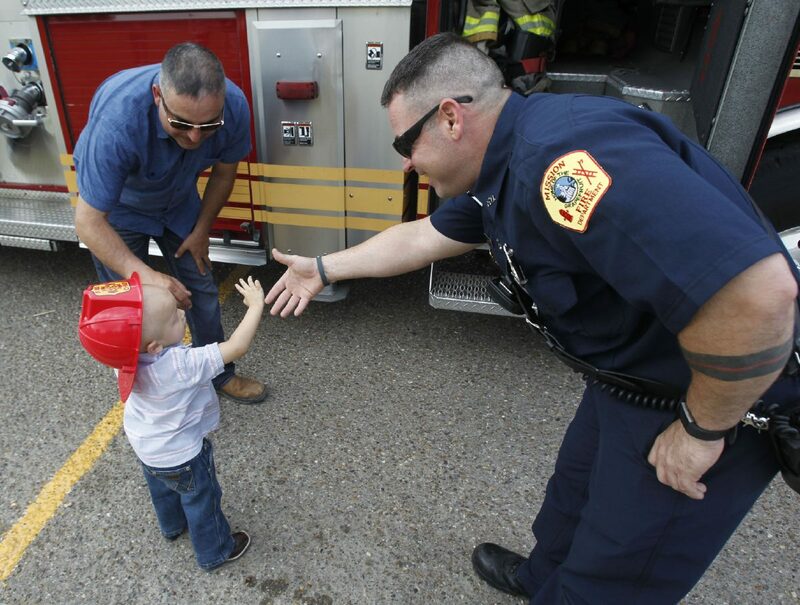 Adrian Alanis, 2, gives a high-five to a firefighter from the Mission Fire Department Thursday, May 11, 2017, at Bannworth Park in Mission. Adrian Alanis, 2, of Edinburg smiles for his mother while playing at the park Thursday, May 12, 2017, at Bannworth Park in Mission. Adrian Alanis, 2, plays peek-a-boo Thursday May 11, 2017, at Bannworth Park in Mission. Adrian Alanis, 2, looks out from the fir truck Thursday, May 11, 2017, at Bannworth Park in Mission. A diagnosis in January of a rare atypical teratoid rhabdoid tumor (AT/RT) came as a surprise, especially without a history of cancer in their families. A nearly eight-centimeter mass was removed from his brain on Jan. 9, and Bubba was diagnosed with cancer a few weeks later. 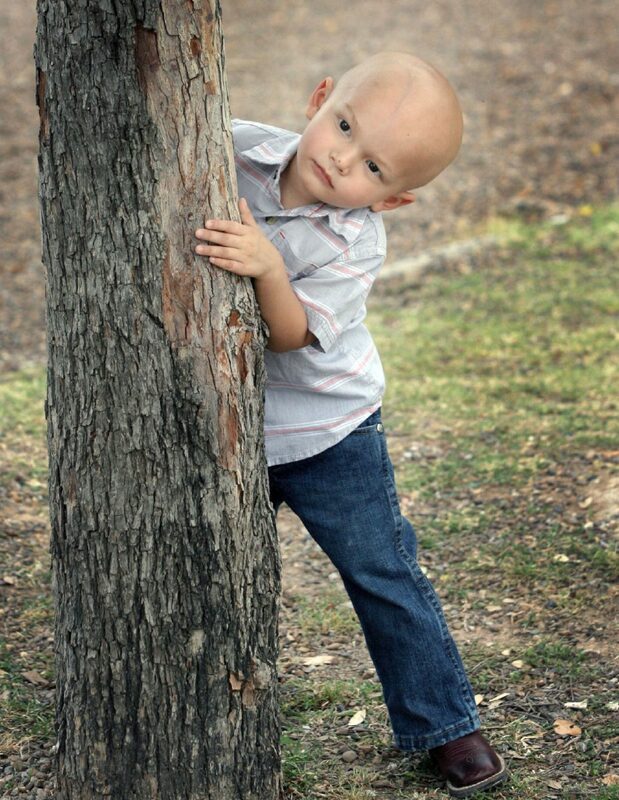 Bubba fought the aggressive cancer with two rounds of both chemo and an experimental procedure at Texas Children’s Hospital in Houston. 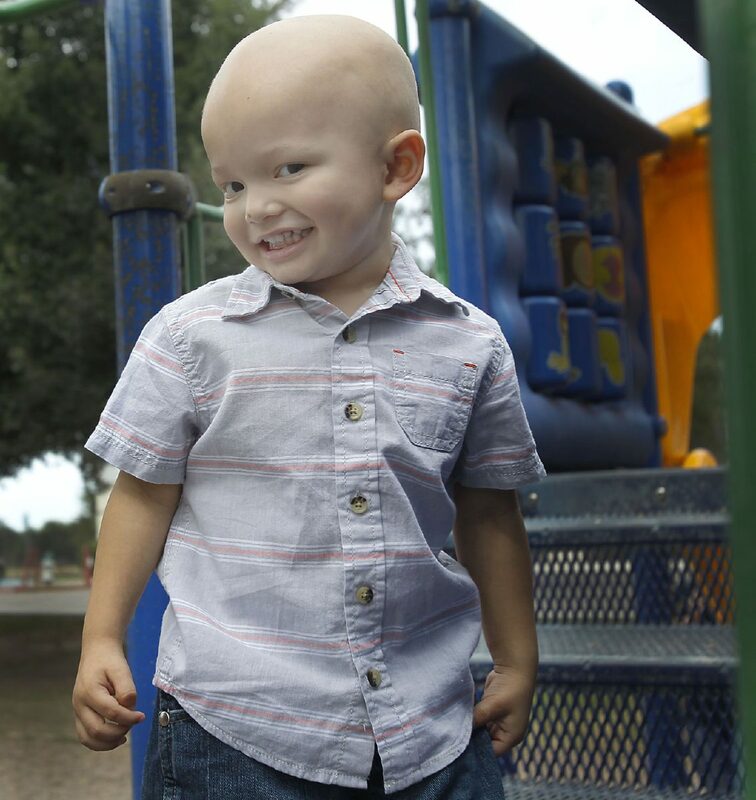 His latest scans show at least 20 tumors throughout his head. There is nothing else his doctors can do, Bubba’s parents were told. Firefighters of Mission Fire Station No 3 stood patiently in front of the two trucks there to meet Bubba. He played on the playground of the park with his family before having access to the trucks. 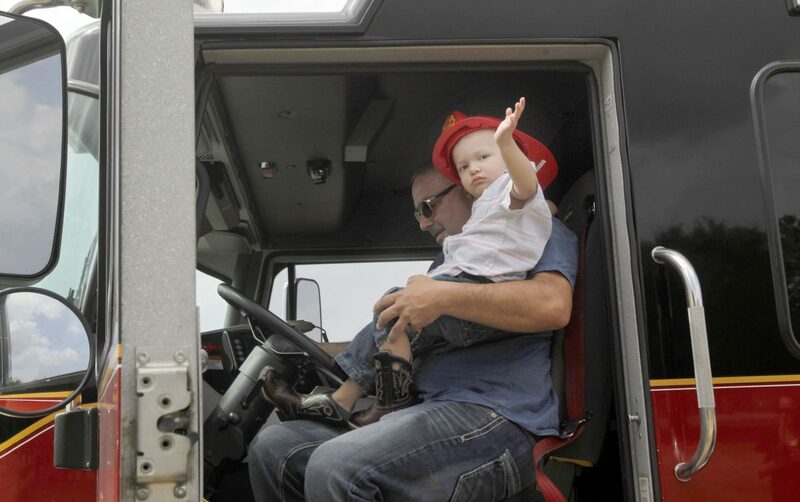 The toddler sat on his grandpa’s lap behind the wheel of a firetruck for pictures and the station gave Bubba a toy truck of his own to keep. Faith Family Friends Foundation helped organize the experience for Bubba and organization President Martiza Esqueda’s camera captured the memory for the family. The group raises awareness of childhood cancers through public events, provides a support system and gives grants to families fighting cancer. Salinas was initially hesitant to be vulnerable about the situation, she said. 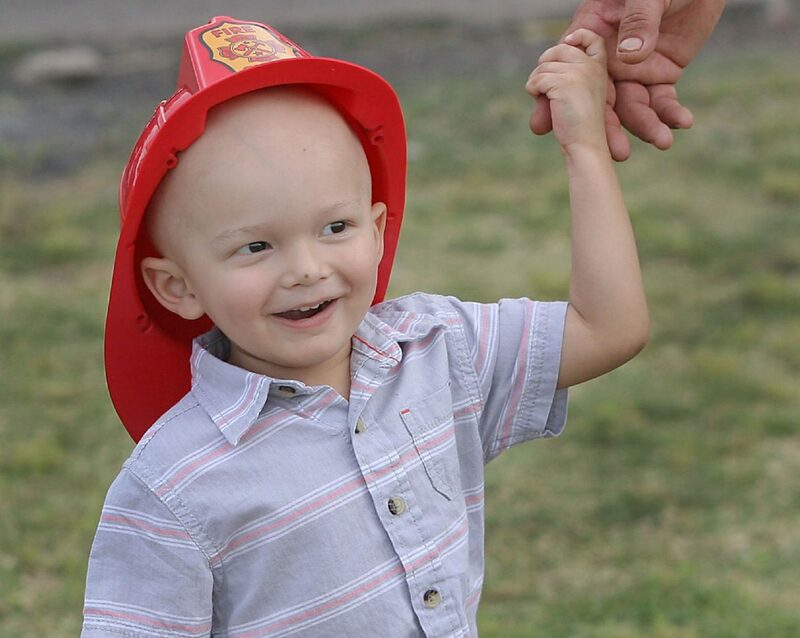 Bubba’s family was joined by local mothers who recently lost their child to cancer. “I was nervous about talking to them, but I think it’s helped me out a lot because I was pretty sad,” Salinas said. There’s comfort gained from a community who can tell you what to expect, said Bubba’s father Hector Alanis, adding nothing can prepare you for actually facing it. Alanis stressed his gratitude for community support, like the Mission firefighters and FFF Foundation. The young parents echoed the common sentiment expressed by others with a family afflicted with cancer: it’s not something one thinks about until you’re forced to. Treatments require frequent hospital stays and there are more medical procedural options outside the Rio Grande Valley. Often at least one parent must quit their job to manage the demanding schedule and travel. Alanis said time with his son has been a blessing since the day Bubba was born. “We’re just keeping faith. It’s all we have left, so we’re keeping faith,” said Alanis.